Our Astrid glove is not only stylish, it’s also high-tech. Built pre-curved and articulated for a perfect fit, this glove is waterproof with 10k/10k HydroWEB and Spylon DWR, and insulated with 200g ThermaWEB. Gloves are used but are in brilliant condition. 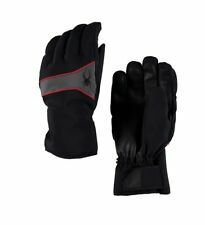 Kids spyder ski mitts gloves. Black. Mens Spyder Puffer Ski Insulated Jacket Black Size Puffer/Padded jacket from Season: F15. 2 zipped front pockets and 1 chest pocket. Insulated and fleece lining. With a white Spyder logo on the left sleeve. * Size - Medium * Excellent used condition. No defects. 9/10 * Pit to pit - 22" * Length - 27.5" Any questions, please don't hesitate to ask. Dispatched with Royal Mail 2nd Class. Designer Spyder ski bottoms. Collection preferred. Spyder ski fleece. great warm fleece. Pictures don't really do the jumper justice, it oozes quality and style ! Spyder Kids (Girls) Ski Jacket Purple. Kids size 140. Condition is great, been used for 4 days. Happy bidding. Spyder Ski Jacket And Sallopettes Suit 13 Yrs. Great used condition, water resistant freshly cleaned, masses more wear, really really warm and top quality kit. 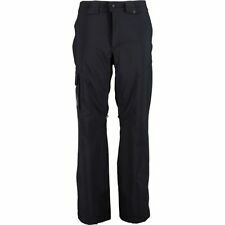 Spyder Girls Salopettes Ski Trousers Age 7. Velcro closure on shoulders for quick removal. Zip closure in middle. 2 zip pockets on side. Trousers can be lengthened - Spyder’s Small to Tall system allows you to let down the hem as your child grows. In good used condition. Dispatched with Royal Mail 2nd Class. Spyder Ladies insulated Ski Suit. Jacket Size 10, Salopettes Size 12. Used. Condition is Used. Dispatched with Royal Mail 2nd Class. Pertex Shield Stretch Polyester 3L with Xt.L™ 20k/20k Laminate and Spylon DWR. Reinforced scuff cuff around bottom hem. Thigh ventilation system. Recco Avalanche Rescue System. The only flaws there are is the two trouser pockets have holes (can easily be repaired/sewn). The jacket has a mark on the right shoulder (see picture). I have thrown in a pair of Spyder gloves which are XL (size 9). womens spyder ski jacket size 6. Condition is Used but only worn once excellent condition no Mark's or tears Dispatched with Royal Mail Signed For® 2nd Class. Above the waist is fleece adding extra warmth on the mountains. This is a small to tall adjustable outfit.The size is adjustable by the shoulders which are Velcro. The legs can be made longer as we haven’t cut them yet. Womens Spyder ski jacket Size 10 BRAND NEW WITH TAGS. This still has the tags and is super warm and cosy. I bought it after going skiing once thinking I would ski again, sadly I have not! Original RRP is £440. Condition is New with tags. Dispatched with Royal Mail 2nd Class. Spyder White Childrens Ski Top. Condition is Used. Dispatched with Royal Mail 1st Class. Spylon with 5000mm. Very good used condition. Light scratches on the arm. In excellent condition, this superb Spyder Ski Jacket is perfect for keeping warm and visible on the snow. In black and fluorescent green/yellow. Size Large ( US 14-16) which equates to 12-14yrs UK sizing. No marks or damage. From a pet free, smoke free home. Dispatched with Royal Mail 2nd Class. If o would like a different service, please contact me before purchasing. Any questions, please ask. 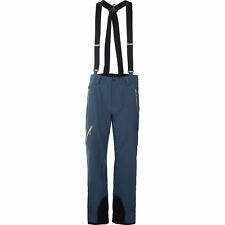 Mens Vintage Spyder Ski Bottoms/ Dungarees Spyder Moe Ski Suit Medium Dermizax. Really good condition no major wear anywhere. Really high quality piece. Best fit a 32 waist. 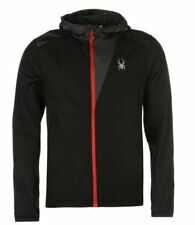 Selling:Spyder Men's Ski Jacket. Size Large. Grey in colour. Brand new with tags. See pictures for info. PayPal only please. Royal mail special delivery. Any questions, feel free too ask. Thanks for looking. SPYDER BOYS LEADER SKI JACKET & SPYDER SALOPETTES- Black and red -. The Jacket and Salopettes say size 20 but it fitted my 11yr old. (again £200 new). Desco Spyder logos. Body - Polyester Stretch Plainweave with Xt.L™ 10k/10k Laminate and Spylon ™ DWR. Rare and stunning ladies spyder ski /winter coat. 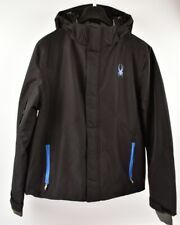 Has a detachable fur trim on the hood and is wind proof. For this coat and it’s been amazing for winters and for skiing in. Has one of the poppers missing shown in photos but doesn’t stop the high neck fastening as the outside poppers hold it in place neatly. Spyder men's ski jacket size L very good condition. Spyder Jackets is easy to help you protect yourself. Whenever you see them, they can bring you a good mood. The exquisite appearance and high quality help it to win more and more fans! Waterproof zippers. Black soft shell jacket featuring 360° Stretch Pearl Laminate. Water resistant finish. Machine wash and tumble dry. Full-length zip with inner draft flap. Long sleeves with zip cuffs. Zip chest pocket. Childrens Spyder Ski Jacket Size 8yrs. Childrens Spyder Ski Jacket Size 8yrs in great condition and cost £160 new. 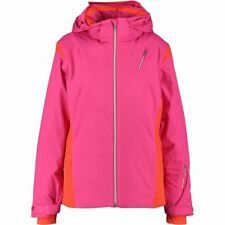 womens spyder ski jacket 16. Fitted pale blue black trim detachable fur hood Condition is Used. Dispatched with Royal Mail 2nd Class.